On Saturday GrandPa came came over and stayed the night. Gwendolyn was so, so excited when she woke up from her nap to his voice. She just loves listening to GrandPa's mesmerizing voice and would not take her eyes off of him. 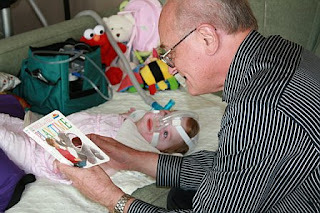 They read books and sang songs and played with the fun balloon GrandPa brought for her. On Saturday night I made a special dinner to celebrate an early Father's Day with GrandPa because we leave on our big trip on June 21st and won't get to see him that day. In the morning we all went for a nice walk and breakfast at one of our favorite places. And during the entire meal, Gwendolyn just kept smiling at her special GrandPa. Thank you Daddy/GrandPa for such a fun weekend!